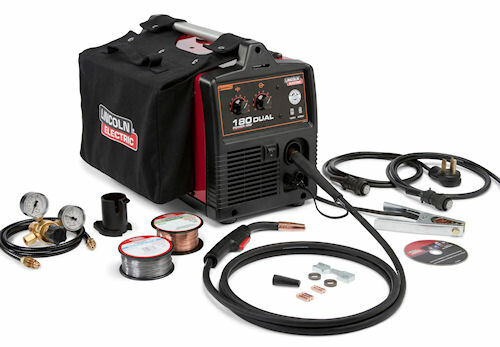 Lincoln Electric just expanded its popular wire welder line for home and shop use. The popular Power MIG wire welder line from Lincoln Electric now includes the 180 Dual, a 68-pound machine capable of MIG welding, flux-core gas shielded operation and flux-core welding with input voltages from 102 VAC to 208/230 VAC. The dual input power capability allows for welding on up to one-half inch steel with self-shielded, flux-cored wire. It ahs a wire feeder speed fo 50 to 500 inches per minute and 30-140 amps output at 120 VAC; or 30-180 amps on 208/230 VAC. The machine is rated at 90 amps at 20% duty cycle on 120 VAC and 130 amps on a 30% duty cycle on 230 VAC. Lincoln's new Power MIG 180 Dual takes 120 VAC and 208/230 VAC for MIG, flux core gas shielded and flux core only welding around the shop, farm and home. The Power MIG 180 Dual cast aluminum drive system offers patented split wire guides for optimal wire alignment and positive wire traction at all speeds. The brass-to-brass gun connection provides improved electrical contact, while a large, industrial closed-design motor improves torque and enhances trouble-free operation. While shipped with a standard MIG gun for mild steel, stainless steel or aluminum welding, the 180 Dual is also spool-gun-ready right out of the box. When paired with the Magnum 100SG spool gun, the 180 delivers enhanced aluminum feeding. For more information on the new welder, visit www.lincolnelectric.com.